Doctor up any meal on the go with this slim stack of 16 spices. For foodies, nothing is scarier than being in a strange place where you're subject to sub-par food. The horror! 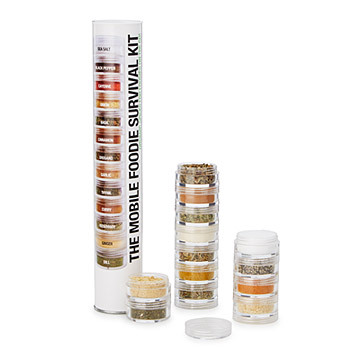 With this handy Mobile Foodie Survival Kit, you can doctor up even the most repulsive meal. The set is stocked with organic herbs and spices, including indispensable seasonings like sea salt and black pepper. The containers are unlabeled so they can be re-used for your favorite spices (save packaging for handy spice identification). Kit includes: Sea Salt, Black Pepper, Cayenne, Onion, Basil, Cinnamon, Oregano, Garlic, Thyme, Curry, Rosemary, Ginger, Dill. Each pot holds about 1.5 tablespoons. Made in the USA and India. The herbs and spices have been certified by the Department of Agriculture as products that are grown entirely without antibiotics, hormones, pesticides, irradiation or bioengineering. Love this! When are you restocking? This has traveled everywhere with us and has slowly broken down. It's made it a couple years though and we need a new one! Plus we need two for gifts. Please please please restock! I was really excited to receive this product as I am currently traveling for work 90% of the time and wanted to have a 'mobile' spice rack if you will. However, when I received the product - many of the containers arrived with damaged grooves on the lids which inhibits me from being able to unscrew nearly half of them because they are cracked. If you are able to unscrew them...there is no delicate way of adding the spice - you can't sprinkle it on because its just one open top...so you either dump it on - or you have to try and use your fingers to pinch the spice on but it ends up being more of a waste and hassle than anything. I wouldn't recommend this product and certainly wouldn't buy it again. While I thought this was a great idea as I love to cook and travel often, once i tried to use it, I found that only a couple of the units would open!! I had several people try to open the individual units for me but they, too, could not open them. Only the top two - salt and pepper - and the bottom four could be opened leaving the rest of the spices unusuable! I am VERY disappointed and would not recommend this to anyone! My husband loves to cook for friends while traveling. Now he has all of the spices that he needs and doesn't have to run to the store each time. Great for a first apartment or a guest house! Spices are expensive and large sizes expire before you can use them. These are the perfect size and a great assortment of everyday spices. Definitely would buy again. Great product! Got this for our small travel trailer where space is limited. Refillable! Love it! We discovered these are perfect for the travel trailer. I would highly recommend it to anyone. It's perfect for keeping in the RV, stays nice in the drawer, very compact and stays together. Way better than having a bunch of seperate seasoning bottles. Great taste too! for all the spices included the cost was super reasonable. spices are expensive, but this gift contains them all!